How to get there: From Stanford University (or anywhere in the Bay Area), get on 280 south and transfer to 85 south. Exit 85 onto Hwy. 17 towards Santa Cruz and travel 9.1 miles (14.6 km) as measured from the exit on 85. This road climbs and you will see signs for Summit Road, as you leave Hwy. 17 in a fairly sharp right hand side exit which climbs to a highway overpass. Go right, ie. cross above Hwy. 17 and measure from here. First, go 4.1 miles (6.6 km) along Summit road, you arrive at an intersection, go straight, Summit Road has turned into Highland Way. At mile 5.8 (km 9.3), a road named Mount Bache Road bears left and uphill. Follow this road to mile 6.8 (km 10.9) where the road forks. Go right along Loma Prieta Way. At mile 9.7 (km 15.6) you are at the trailhead. The last few meter was on dirt, there is room for parking on your right hand side. This location is N37:05.821, W121:50.808, elevation 931 meter. Route description: From the trailhead there are two roads, take the leftmost, this road heads uphill. You pass through a gate and there are signs that essentially says that you should not drive any further without special permission. The area is private, but the owners seem to tolerate a few hikers that just follow the road. Follow the road as it first climbs, then traverses along a pretty flat section before reaching the base of the summit part of the mountain. 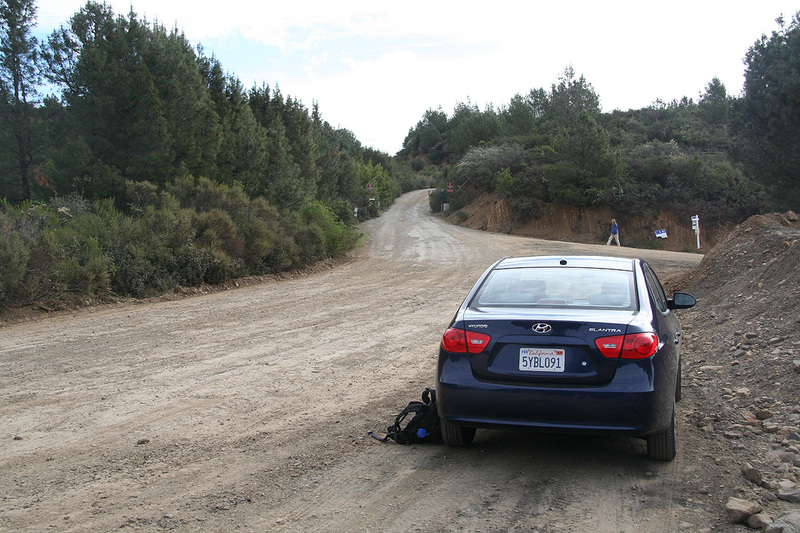 The main road heads downhill on the right, a dirt road forks left and immediately forks into two separate roads. It is obvious that the right choice is the rightmost of these two. This road clearly climbs the hillside and passes through another (open) gate a bit further uphill. Follow this road, higher up it forks again, take the left turn and pass through yet another (open) gate with a few (very rusty) no trespassing signs. This road continues to climb the hillside and contours around the top before reaching the summit plateau. The summit is a ridge, slightly higher in the north end. 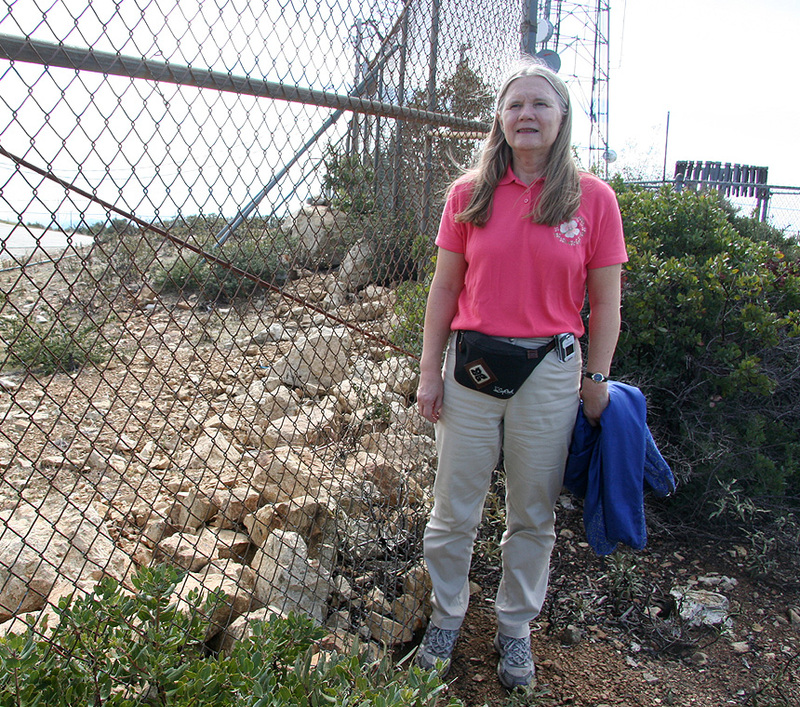 The highest point is just where a fence runs across, however certainly high enough also on the outside of the fence. Comments: I made this hike with my wife Heidi. The forecast called for rain, however the morning was looking good and we figured that a short walk to start off the day, would be just right. We left the trailhead at 0950 and made the summit in about 30 minutes. We spent 10 minutes on the top, the view is quite good, however somewhat spoiled by all the antennas that populate the summit ridge. The highest point is located in the vicinity of the northernmost antenna facility. There is a small bump that is halfway inside and halfway outside the fence. 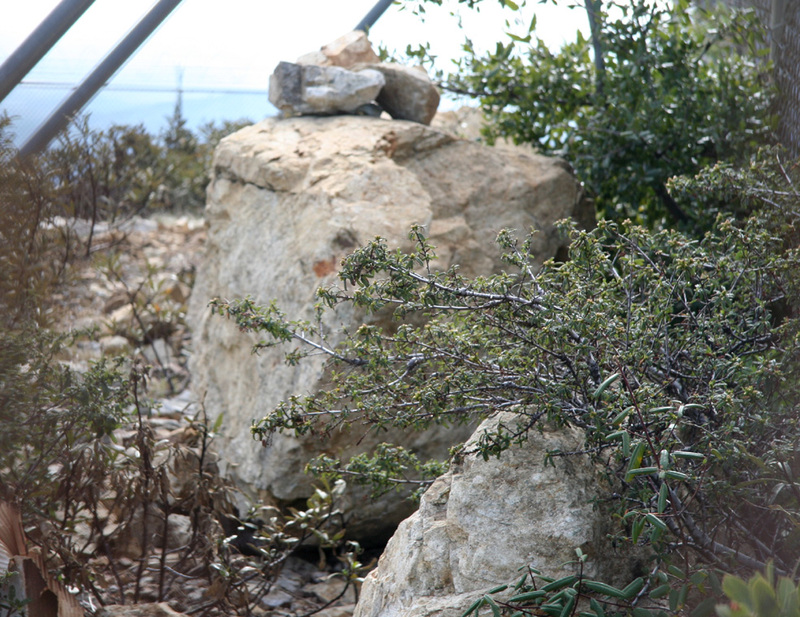 There is a rock just on the inside that possibly marks the highest point, however, it may very well have been moved into its current position by the construction activity that has taken place. This rock is still close enough to the fence that it may be touched, most easily by using a short stick. See pictures below. The bad weather moved in as we returned to Stanford. Under the assumption that things would improve later the next day, I planned a trip to climb San Benito. The trailhead, proceed along the road that runs straight ahead. 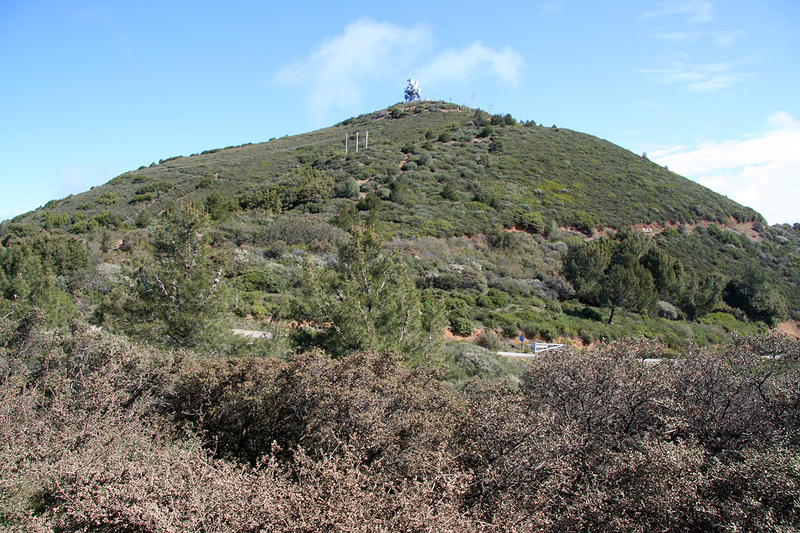 Loma Prieta, the summit ridge. San Jose, as seen from the summit. 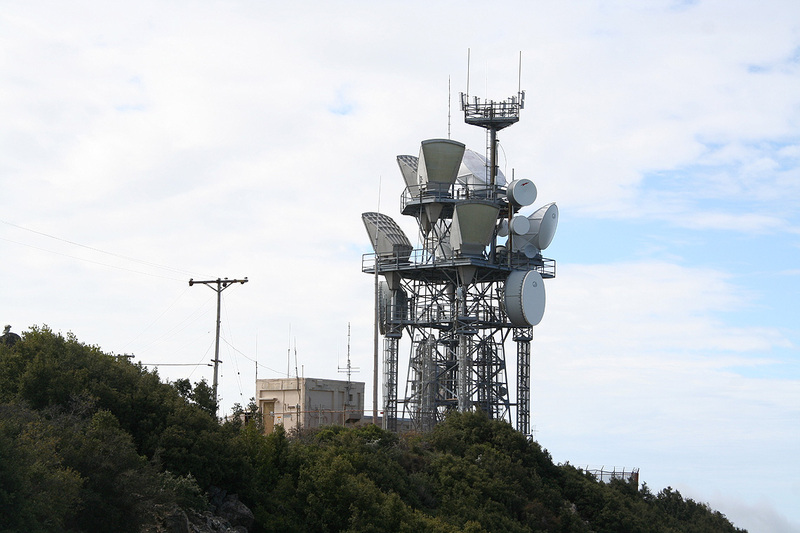 Antennas, there are many more on the summit ridge.